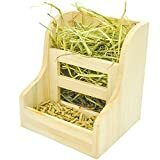 Should I get a guinea pig hay bin, hay dispenser or a simple hay holder? The answer is, that while you can get creative (and even make some DIY projects) a good ol’ hay rack is the most sensible way to go. Below we have listed our top three picks, which are the only ones we've found that fit criteria above. The greatest feature of this hay feeder is its spring-loaded grill design. It means that the metal that keeps the hay in place just adjusts itself whether the hay increases of decreases. That is a sure way to keep the hay in place and prevent your pet for making a huge mess inside the cage. In addition, the grill was designed to have wide spaces in between so you won’t have a problem with your pet’s head or tiny feet getting stuck and you will have a peace of mind leaving them with the hay feeder within the crate. Your pet cannot easily chew on this feeder because it is made from durable and high-quality plastic material. Cleaning will also be a breeze with this. This is a good investment for your guinea pig, It’s sturdy, it’s an effective mess-preventer and completely safe for your pet. This hay feeder doubles as a pellet or food container. It is great for keeping the food and snack in one place which means the food crumbs will also just stay in that area and makes cleaning easier and quicker. If you have a chewer guinea pig, this might be the perfect hay feeder for you since it is made from a natural wood. However, our concern about this feeder is that it is made of Pine wood. Based on research, Pine wood is a kind of wood that can be toxic to guinea pigs. When it comes to wood shavings, pine is a nig no-no because it releases chemical compounds that may cause severe allergies on your pet. So far, there are no reviews yet from a guinea pig owner that says that this feeder caused their pet to get sick. Another thing is, wood absorbs liquid. It will absorb urine, water, etc and you may end up throwing it sooner than expected. However, you can choose to hang this in your pet’s cage. After all, it has a snap-lock bracket system that makes it easy to attach to any wire cage. Just like the Mkono Hay Feeder, this one also has a spring loaded grill design to make sure that the feed stays in place so that there will be lesser mess, if none at all. It is also made from hard plastic and metal to make it last long. The features of the M-Aimee Alfalfa Hay Feeder Manger Rack are closely similar to the Mkono Hay Feeder. There is only a slight difference in price, this one being more expensive. 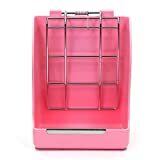 In terms of quality, a few guinea pig owners would prefer other feeder than this one because there have been issues regarding the quality of the plastic body and the knob that attaches it to the cage. However, performance wise, it still serves its purpose – which is to keep hay inside the feeder to prevent it from spilling all over the place (and into the bedding).